If you need a new set of teeth, you’re not alone. According to the National Institute of Dental and Craniofacial Research, more than 30% of seniors over the age of 75 have no remaining teeth. But the fact that tooth loss is a common problem doesn’t make it any easier to go through. Luckily you have options available. The most common ways to replace a full set of teeth is either with all-on-4 dental implants or dentures. Both options offer unique benefits and the choice you make will depend largely on your personal preferences and lifestyle. Dentures are removable false teeth. The denture is made from an acrylic base that fits over your gums. The while the upper denture has an acrylic base that covers the whole upper palate, the lower denture only fits over the area of your gums where your lower teeth would normally be. Because dentures are removable, they require special care keep them clean and proper for use. Dentures also can’t be worn while you sleep and need to be removed daily. Apart from cleaning your dentures, you’ll still need to use a toothbrush to clean the inside of your mouth on a daily basis. Dental implants can be placed into the jaw to support a set of removable dentures and make them more comfortable. The average lifetime of a set of dentures is 5 to 8 years. However, this will depend on the quality of the denture, as well as the rate of degeneration of bone tissue in your jaw. If your bone tissue degenerates faster, your dentures will have to be adjusted and/or replaced more frequently. 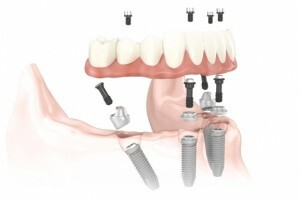 All-on-4 dental implants serve as a permanent, non-removable tooth replacement option instead of dentures. 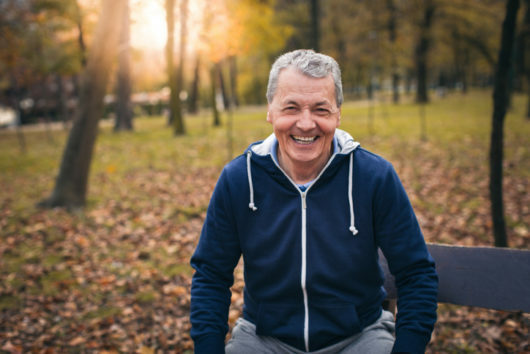 While conventional dentures tend to be the most common and well-known tooth replacement option for edentulous patients, all-on-4 implants is arguably the most advanced, modern alternative to replace a full arch of teeth. The aim of all-on-4 implants is to provide a full set of new teeth that’s just as comfortable and convenient as still having natural teeth, all while keeping treatment time and cost to a minimum. Treatment consists of four implants that are placed in either the upper or lower jaw. An arch supporting the new teeth is then attached to these implants. The all-on-4 procedure can be completed from start to finish in only a day. However, with the initial surgery on the first day, patients only receive a temporary set of teeth. The life expectancy of all-on-4 dental implants is lifelong. Meaning you can expect to only pay for your implants once and never have serious dental issues again. All-on-4 Implants Vs Dentures – Which Is Better? As far as comfort, convenience and quality of life is concerned, all-on-4 implants are definitely a better option than dentures. However, the cost of each procedure also has to be taken into consideration. Cheap dentures can cost as little as $300, but won’t last long as more expensive options. A more realistic price range for good dentures is between $1000-$3000 or more. At the higher end of the price range, a set of dentures that aren’t supported by dental implants can cost up to $8000. 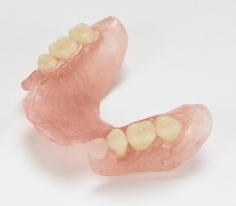 This large price range is due to differences in quality and the material the dentures are made from. The cost of implant-supported dentures can range from $6000-$30,000 depending on the amount of implants used to support the denture, as well as the type of implants. All-on-4 dental implants can cost between $20,000 to $50,000. Compared to some of the more expensive denture options, this price range isn’t much higher. According to the Realself, a website with reviews and cost averages of cosmetic procedures, the average cost in the US for all-on-4 implants is approximately $28,700, the website also give a 95% satisfaction rate for the procedure, meaning most patients consider the all-on-4 procedure well worthwhile.